I had read Wilson Popenoe's book Manual of Tropical and Subtropical Fruits. Under the section of Sapotaceous fruits he stated, "The green sapote Pouteria viride is really superior in flavour to the common sapote (P. sapote)". We already had fruiting mamey sapote in Florida, but I had never heard of the green sapote bearing in our subtropical state. A letter was therefore sent to Dr. Popenoe at the Escuela Agricola Panamericana at Tegucigalpa, Honduras where he was the director. In this correspondence, I made a request for green sapote seeds. In his reply, he stated there was only one of these trees on the campus and the students picked all the fruit prior to reaching maturity. However he did forward green sapote scionwood and suggested grafting it on seedling rootstocks of the related mamey sapote. In November of 1954 upon receiving the green sapote graftwood, I took it to the late John Tower, propagator at the Brooks-Tower Nursery in Homestead, Florida. I had recently imported six hundred mamey sapote seeds from Havana, which I had given the above nursery, hoping to better establish more of these Cuban fruit in South Florida. Mr Tower, an expert at grafting, used Dr Popenoe's scionwood to graft up some of the resulting mamey sapote seedlings as well as put scions of this Central American fruit on mamey sapote trees which were approaching bearing size in the nursery. After these scions took, I wrote Wilson Popenoe of our success. He then sent me a reply in which he stated, "I suspect that (this) is the first time anyone has made this graft". What is believed to be the first instance of the green sapote fruiting in Florida took place seven years later in the fall of 1961. Prior to this, hundreds of seeds of this sapotaceous fruit had been introduced into our subtropical state by various agricultural experiment stations, none of which survived to become bearing trees. My green sapote, grafted on to the mamey sapote as a rootstock is currently (April 1993) 55 ft (17 m) high with a trunk diameter of 16 inches (41 cm) in spite of taking every hurricane passing through this area since the late fifties. Shortly ofter it was originally planted out in the ground, it was attacked by fungus at the graft union causing extensive die-back and nearly girdling the trunk. Bark from the infected area was removed and a soft paste made up by mixing copper sulfate fungicide with Volck agricultural oil was applied. This resulted in a complete recovery and the fungus did not reappear. My green sapote bears from late December through March. The crop varies from hundreds of fruit to only a few dozen. As this matures in the dead of winter I find Florida-grown green sapote lacking flavour and seldom do I bother to harvest its ripe fruit. However, off season, summer-ripening fruit are really delicious. Unfortunately these out-of-season fruit seldom appear. 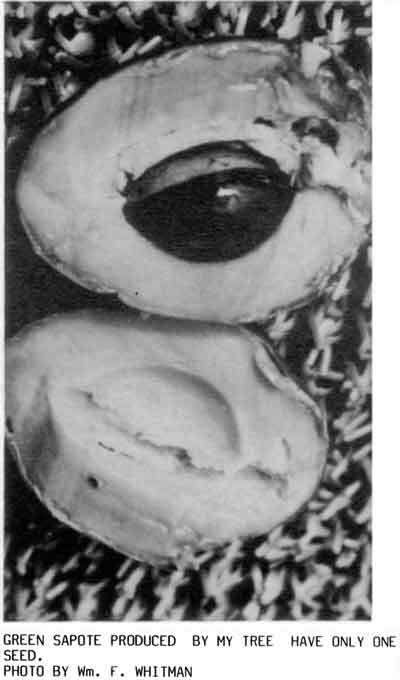 When the green sapote was first introduced into Florida, it had been hoped that they would prove to be cold resistant to a greater degree than the common lowland mamey sapote. Observations by the writer suggest the reverse to be true. During our infrequent, severe, winter cold fronts the green sapote appears to be the more subject to cold damage of the two. Also, as this Central American tree is reported to have a lower limit of 3,000 ft elevation and an upper one of 7,000 ft elevation where it is found growing in the wild, South Florida's near-sea level altitude with its long, hot summers is quite different from its natural environment. This results in seedling green sapote making poor growth. However grafting them on the related mamey sapote improves their vigor. It has been suggested that we should seek out green sapote that come from the lowest elevations in their indigenous mountainous areas hoping to discover strains more suited to the hot lowlands. Originally we had done just the opposite, reasoning the trees coming from the highest elevations would take the most cold. When the first green sapote trees bore in South Florida, many of us had high hopes for its future. Since that time, the related mamey sapote has come into its own with over 300 acres planted out in commercial groves. Meanwhile, the green sapote remains a door-yard curiosity with no hope of a monetary future here in Florida. Possibly if summer-bearing strains with superior fruit quality were introduced, this seldom-seen Pouteria could become common in our produce markets. 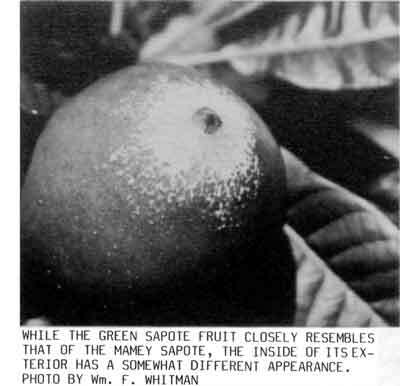 Hopefully some member of the RFCA of Australia can update us on their experiences with the green sapote. Unlike Florida's flat lands, you have mountains, where this sapotaceous fruit should thrive under conditions like its natural environment. Over the years, I have made many green sapote seed shipments to various Australians including Paul Recher, who on one occasion was mailed thirty pounds. From what I have heard, you have found this fruit to grow well and bear heavily on your "Continent Down Under".